If you like cherry shrimp but want something a little more exciting, snowball shrimp might be for you. Though just as easy to care for as their cherry cousins, they are white instead of red. A great eye catcher in any shrimp tank! Keep reading for everything you need to know about snowball shrimp care and keeping snowball shrimp in your own aquarium. 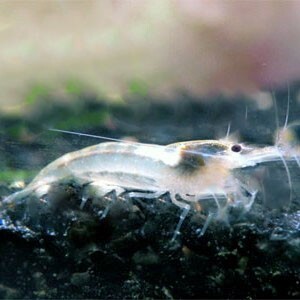 Setting up a snowball shrimp aquarium is not much of a challenge, which makes these Neocaridinas perfect for beginners. Ideally, get at least a 5 gallon (19L) aquarium; any smaller and water values might fluctuate too much. Other than that the only absolute must-have is a filter. It cycles the tank to make it shrimp-safe and removes any debris that might cloud water. If you're interested in breeding your snowball shrimp be sure to go for a sponge filter or something with an intake cover to prevent baby shrimp from being sucked in. A happy, stress-free shrimp shows nicer color and breeds more quickly, so be sure to add plenty of hiding places to your tank. Live plants and shrimp flats will be much much appreciated. Snowball shrimp can survive in a very wide range of temperatures, which means room temp should be just fine in most cases. If the temperature in the room the tank will be in is prone to fluctuating (due to open windows, for example) consider getting a heater to keep things stable. One of the reasons many Neocaridina varieties (including snowball shrimp) are such a good choice for beginners is that they're not really picky about water values. They can survive in a wide range as long as the tank is fully cycled and ammonia and nitrites are always at zero. Worst case scenario, they can even handle a beginner mistake here and there. pH can be low to high, water can be hard to soft and any indoor temperature should work just fine. To keep your water quality in check, be sure to test regularly using a liquid test kit; test strips are less accurate and should be avoided where possible. Do weekly water changes to keep the nitrates in check but be sure to always match the temperature and pH and add the new water slowly. Because snowball shrimp are quite hardy and breed relatively quickly there are some options when it comes to tankmates if you don't mind losing a few fry here and there. A peaceful community tank should make a fine home for your snowball shrimp. If you want to be absolutely safe go for harmless fish like pygmy Corydoras or Kuhli loaches. As with all shrimp, if you're really serious about breeding your snowballs you're probably best off going for a single-species or at least an invert-only setup. That way your fry can't fall prey to hungry fish and the shrimp will feel safe enough to breed. Snowball shrimp are omnivorous and will eat anything edible they come across. In aquariums with plenty of algae and other biofilm-covered surfaces you barely need to supplement their diet. Unfortunately most of our tanks are very 'clean', which means there is not enough food for the shrimp to survive off. In these situations you should feed a high quality shrimp food every day or so; you can also add some variety with fresh blanched veggies, frozen foods and even hand-picked foods like organic nettle leaves. Remove any uneaten foods within a few hours to prevent the water quality from deteriorating. If you're looking for a shrimp that's easy to breed, this is definitely a good contender. As long as everything else is in order and water quality is high, female shrimp should pretty much always be carrying eggs. These hatch after 30-45 days into tiny copies of the adults. You don't have to separate these and special care is not needed: they will feed on biofilm until they're large enough to forage alongside the adults. Once they've colored up you can select the best ones with bright coloration to continue your line with. The more translucent offspring of 'lesser' quality can go in a separate tank or you can sell them at a reduced price. Keep in mind that there are many Neocaridina varieties that all interbreed. While keeping different colors together (snowballs and cherry shrimp, for example) makes for a real eyecatcher it will eventually result in brownish offspring. Snowball shrimp are not as popular as other Neocaridina varieties like red cherries or yellow shrimp yet, which means they can be a little difficult to find in your local aquarium store. Luckily there are plenty of hobbyists selling them online and you can also order them from reputable stores. The Shrimp Farm sells snowball shrimp here and ships them right to your doorstep with live arrival guarantee!